As the most recognised painting prize in the UK since its inception in 1957, the John Moores Painting Prize acts as a review of contemporary painting, presenting a survey of dominant themes explored by the medium. Noticeably, many of this year’s artworks depict architecture as the protagonist. However, historically architecture in painting was considered as a supporting role to frame a linear, traditional narrative created by figures and props. 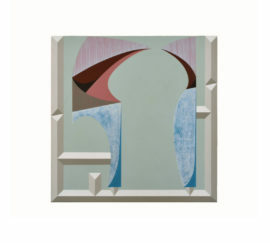 On entering this year’s prize, we are met with a small but powerful painting, ‘’One, The Side-ness of In-Out’ by Selma Parlour, dominated by architectural language. Parlour presents an ambiguous, graphic scene that could be interpreted as looking through a segmented frame. Formally it is reminiscent of skirting boards and cornicing, suggesting diverse origins such as Victorian architecture and modern high rise buildings. Shapes are very clearly delineated in a limited, bold colour palette, with little evidence of brushstrokes, with a smooth, flat surface through layers of glaze. This smooth exterior contributes to the ambiguity in the work, as we are left wondering if the frame is a window, and how are we positioned in relation to it – is it a room or gallery, a street or square? A similarly puzzling positioning of architectural structures is offered by Michael Simpson, in his overall winner, ‘Squint (19)’. 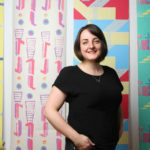 Immediately, we are presented with an architectural protagonist – a bench or a stairwell – a lonely and humorous character wedged diagonally across the canvas. Simpson’s painterly marks are obvious unlike Parlour’s, where nothing is left undone. We can see Simpson’s sweeping strokes of the floor and rolled background surface. The edges of the canvas are textured, revealing colours attempted before in green and pink. The bench/stairwell has been painted flat, although there is a horizon line, without perspective. Again, we are left with numerous questions – is it a grid or furniture? Why is the bottom yellow, and is it reflecting from somewhere else? This yellow is carried to the curious drawer slot in the top right hand corner- which can be interpreted by the title, ‘Squint’. This was the name for a peephole used by a lord or steward in medieval times to survey activity in their property. However, in this scenario the architectural space is devoid of people, and suggests a somewhat familiar industrial or modern interior space. Further into the exhibition, a small but succinct painting is Freeloader (2014), acrylic on panel, by the late Ben Cove. 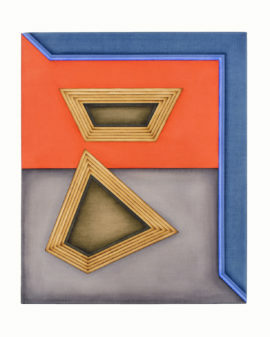 A smooth, satisfying composition of curves and forms, Cove uses trompe l’oeil techniques to create tone and delineations. Textured sections allude to murals and Italian frescoes, which would be physically overwhelming in scale, but here is intimate and well considered. The title suggests an awareness by the artist of his borrowing of art and architectural references. As we turn to a central panel in the exhibition, the viewer is no longer left in uncertainty about what the artist is depicting at face value. Three small ‘photo realistic’ paintings of scenes of Britain shift our attention in scale to; ‘No Ball Games Here’ by Mandy Payne, ‘Figures in An Arch’, by John Middleton and ‘Beasts of England’ by John Starks. 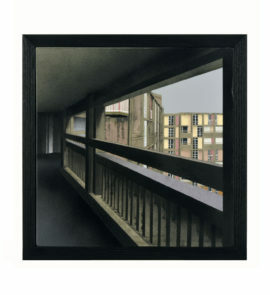 In ‘No Ball Games Here’, Payne portrays the iconic modernist Park Hill flats in Sheffield in spray paint on concrete within a wooden frame. The painting is delicate and detailed, taken from the view of the dark balcony, portraying an inhabitants experience rather than the recent glorification of the flats as a symbol of the fashionable resurgence of modernism. The miniscule, grubby, sometimes uncontrollable dots of spray paint, lend itself to the cold atmosphere of this concrete walkway. Disappointingly, the frame disguises the concrete that Payne has painted on. Without the information panel, we could easily confuse the surface for canvas, it would be interesting to see the bare concrete texture which her subject matter is constructed from. Other paintings within the exhibition allude to architectural forms and urban environments from a distance. 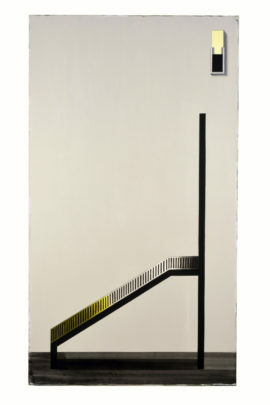 ‘Notebook Architecture’, oil on aluminium, draws a corner of a building, with no clear point of perspective. In a slightly disturbed idyllic scene, ‘Blue Drift’ by Graham Crowley, shows distorted reflections of traditional country houses upside down, seemingly in water. Lastly we are led through works some of which explore interior spaces. Emma Talbot’s painting, ‘It Came To Me In A Dream’, creates interior portals through imagined patterns and decorative details to tell an emotive narrative. 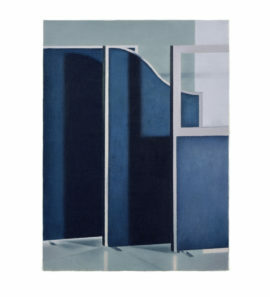 In ‘Untitled’, by Christopher Hanlon, the central screen plays the main role. The muted ‘evening’ tones are reminiscent of mid war interiors, and the three tiered screen is in its intriguing by its majestic presence, which is contrasted by its practical feet that suggests a temporary dividing screen in a school or hospital. 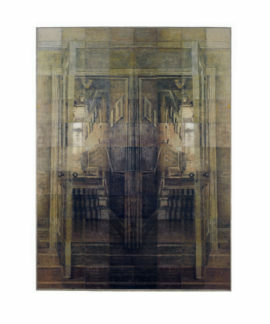 Eighty eight pieces of oil on linen, comprise Bella Easton’s, ‘Passageways’. This squared jigsaw effect makes us consider both our present digital environment and the nostalgic past. We are offered two identical passageways in one sophisticated sepia tonal range that closer up appears almost crayon like in texture. Struggling to squint, struggling to see where we are positioned, we are right back to the very beginning, perplexed and disconcerted within this pictorial space, with no linear narrative. The John Moores Painting Prize 2016 continues at The Walker Art Gallery, Liverpool, until 27th November 2016. More information here. With thanks to a-n and Ann Flenley of the Walker Art Gallery for the Critical Writing Bursary and their kind assistance.